A QUICK MESSAGE FROM ARTIST, CHARLIE FRYE! Charlie Frye, a painter from Lenoir, North Carolina, is also in his first year at the festival. His folk art, painted in acrylic on a variety of items from rusted pie pans to wooden doors, focuses on memory and his interests. A vast array of colorful paintings, various antiques and artwork are spread throughout the gallery while the sound of music from the 1931 song “Dream a Little Dream of Me” could be heard in the background. Frye Art Studio in Lenoir, NC showcases the colorful, approachable paintings of self-taught artist Charlie Frye. 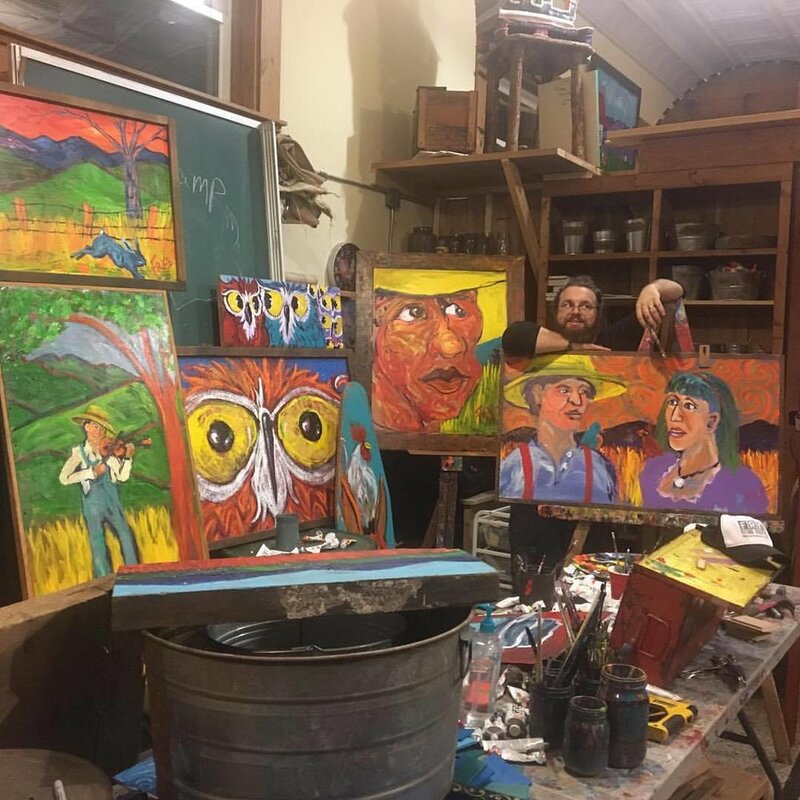 His studio offers art classes as well, and has become an essential place to visit for anyone interested in North Carolina folk art, or just having a good time. Charlie Frye’s work looks at life in the Blue Ridge and the animals and people that make it interesting. Charlie works out of his studio in downtown Lenoir, NC. You may have seen his work at Root in Vine in Morganton or featured on UNCTV. He has also been commissioned for the 2016 Red, White and Bluegrass art. Frye's work is on display in Morganton City Hall May through June 2016.